….enjoy your ride, you’re surfing! Yes, it really is that simple! And we are on hand to help. We will show you how if you book a surf lesson now. 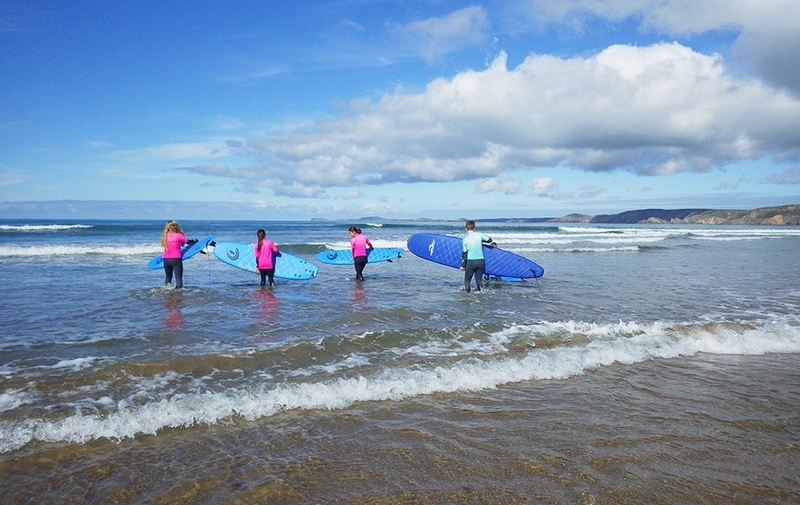 Have you ever tried surfing in Wales or just been in the sea? Yes? Then you’ll know the feeling you can get from this simple pleasure! If you have never been…then come on down…it’s super fun! 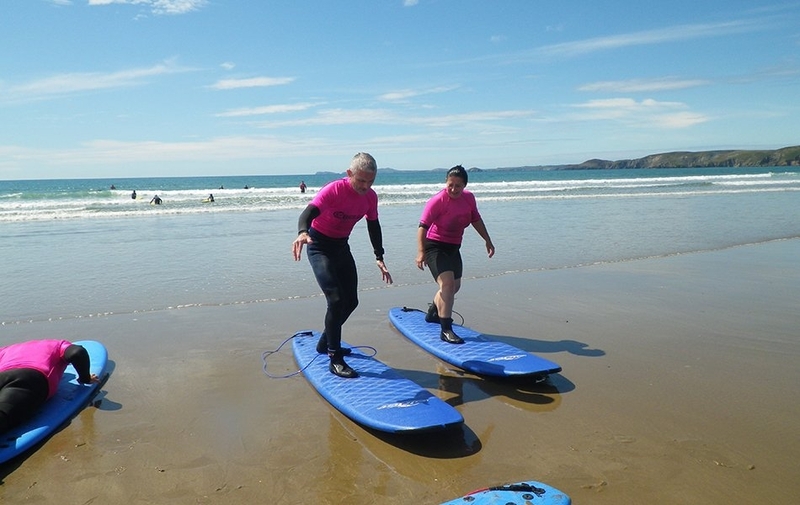 Surfing is a sport for everyone, young and old. At Board Games our priority, second to your safety, is that you’re having fun! We aim to give you an experience that will leave you feeling happy but tired from all the laughter and newly learnt skills! 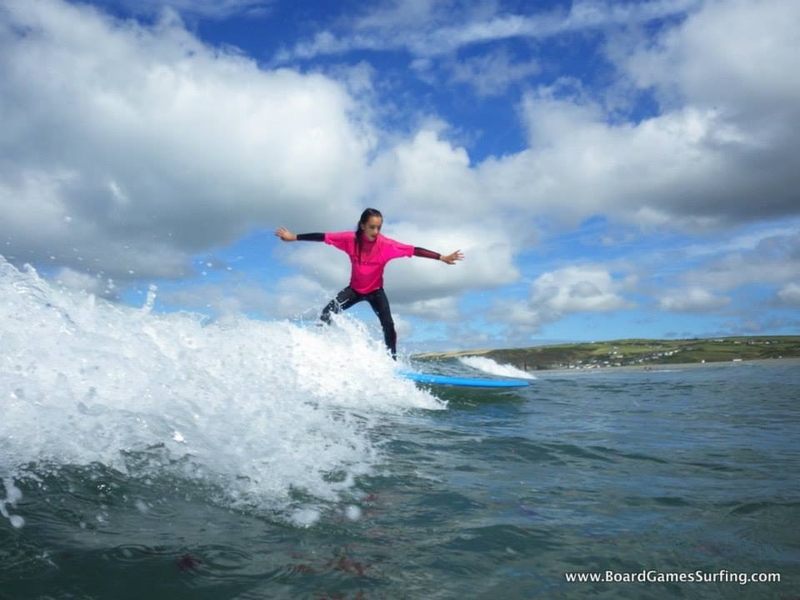 Boarg Games guarantee you’ll make a splash….surfing, bodyboarding or bodysurfing! 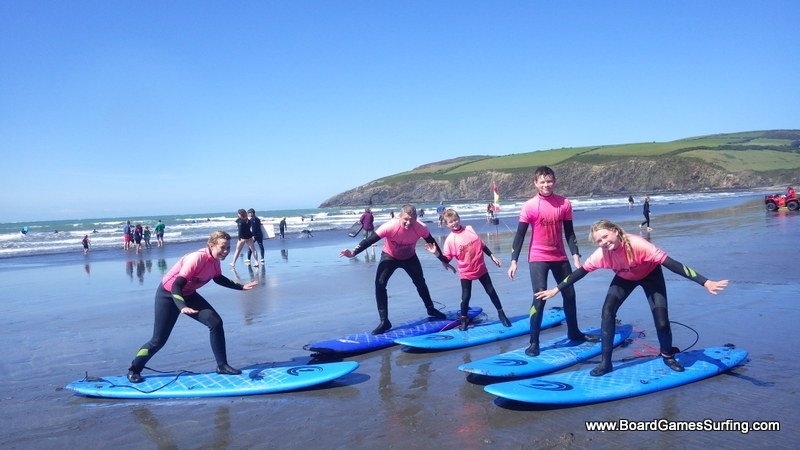 We are passionate and enthusiastic about surfing and the coastal environment in Pembrokeshire. 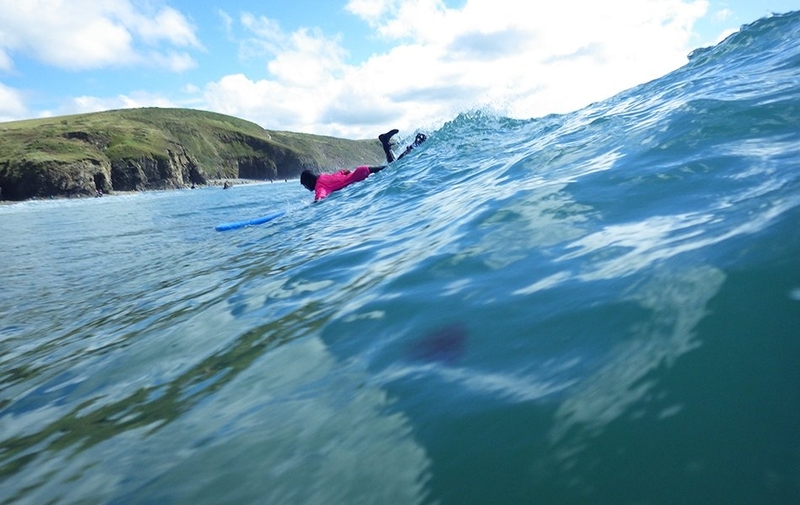 Our team care for everyone that wriggles into a wetsuit and wants to get in the sea. We’ll ensure that despite being in a group environment you will get individual attention and tuition. 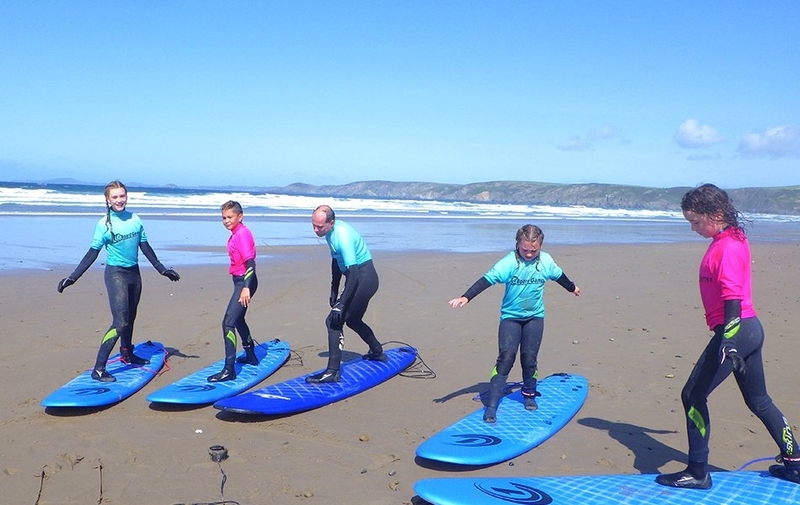 If required, we can tailor a bespoke surf experience just for you or your group. 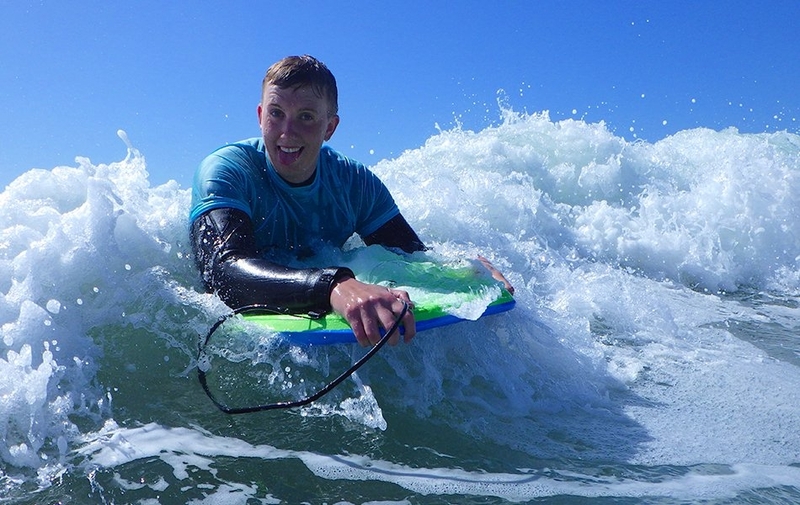 When you arrive at the beach you will be greeted by a member of our team who will take the time to find out your expectations and any previous surf experience that you may have. 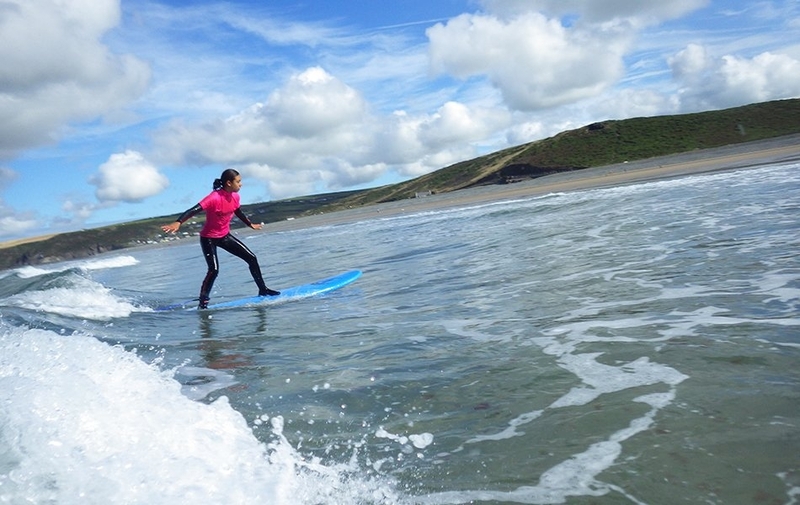 No need to worry if you’re a beginner surfer, we’ll soon have you feeling relaxed in the sea environment! We will teach you everything you need to know in easy bite-sized chunks so you don’t feel overwhelmed. Throughout your experience, you will have a dedicated, fully qualified and fully fun instructor close at hand. 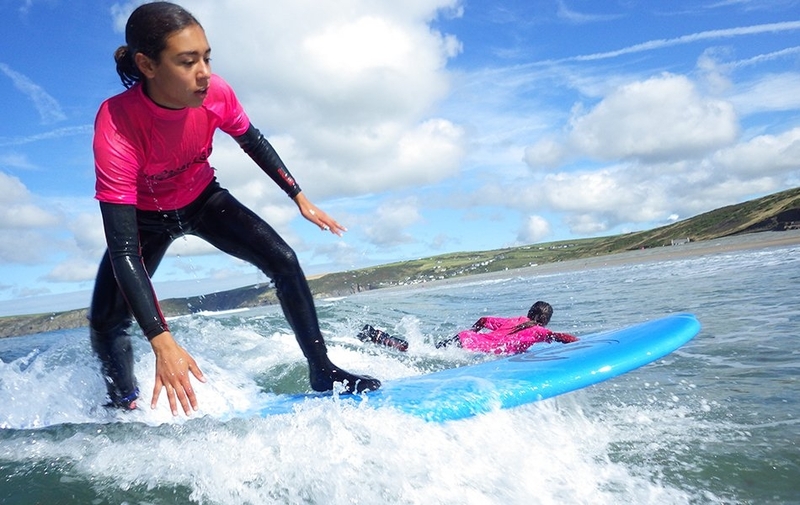 We supply all the kit and equipment you’ll need including a full winter steamer wetsuit, wetsuit boots and a surfboard or bodyboard too! If it’s a bit chilly out there we also have wetsuit hoods and gloves to keep you cosy and warm. Our team take safety equipment and a first aid kit down onto the beach. If you need to take anything to the beach with you no worries…we’ll have our handy bag with us! The only thing you’ll need is swimwear (to go under our wetsuits) and a towel. Oh and maybe some sunscreen! 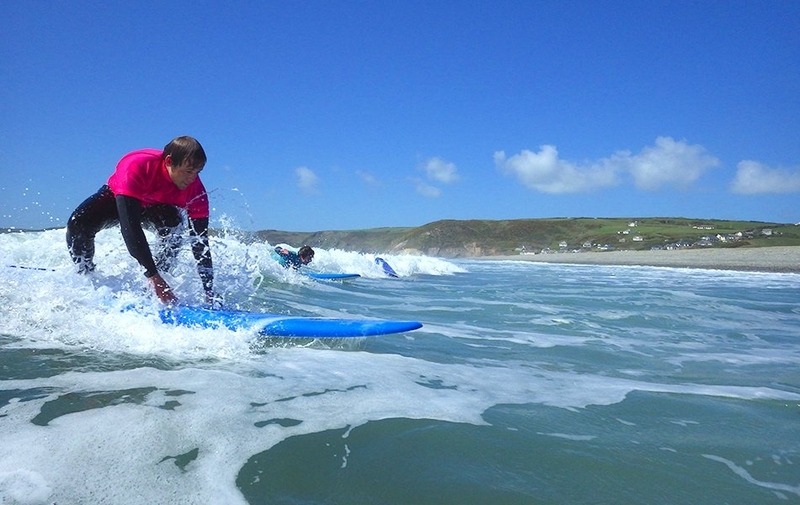 One of our favourite Pembrokeshire surfing locations is Newgale beach, a long sandy beach, situated to the north east of St Brides Bay. Westerly facing, it is ideally placed to catch the prevailing Atlantic swell. 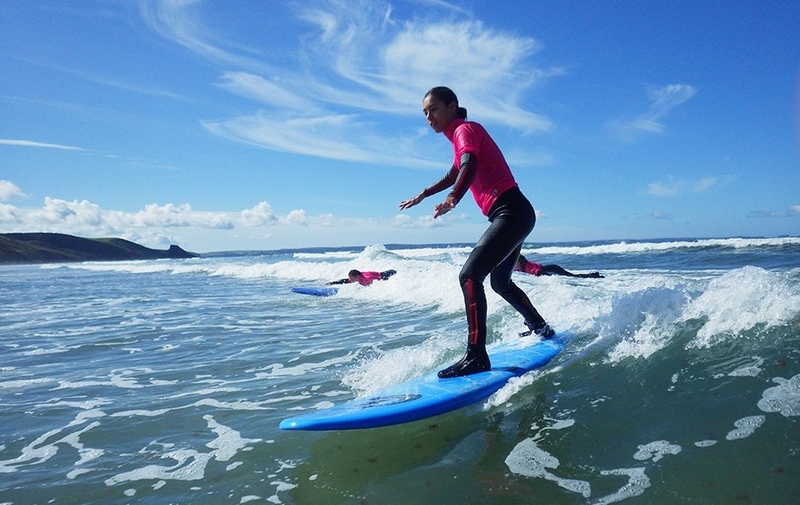 Its beach break is ideal for beginner and intermediate surfers alike. For centuries, surfing was a central part of the ancient Polynesian culture. Surfing may have first been observed by Europeans at Tahiti in 1767 by Samuel Wallis and the crew members of the Dolphin who were the first Europeans to visit the island in June of that year. Another candidate is the botanist Joseph Banks being part of the first voyage of James Cook on the HMS Endeavour, who arrived on Tahiti on 10 April 1769. Lieutenant James King was the first person to write about the art of surfing on Hawaii when he was completing the journals of Captain James Cook upon Cook’s death in 1779. References to surf riding on planks and single canoe hulls are also verified for pre-contact Samoa, where surfing was called fa’ase’e or se’egalu (see Augustin Krämer, The Samoa Islands) and Tonga far pre-dating the practice of surfing by Hawaiians and eastern Polynesians by over a thousand years. (8 November 1883 – 7 April 1919) is often credited as being the “Father of Modern Surfing”. He is thought to have been the first modern surfer. In 1907, the eclectic interests of the land baron Henry Huntington brought the ancient art of surfing to the California coast. While on vacation, Huntington had seen Hawaiian boys surfing the island waves. Looking for a way to entice visitors to the area of Redondo Beach, where he had heavily invested in real estate, he hired a young Hawaiian to ride surfboards. George Freeth decided to revive the art of surfing but had little success with the huge 16-foot hardwood boards that were popular at that time. When he cut them in half to make them more manageable, he created the original “Longboard”, which made him the talk of the islands. To the delight of visitors, Freeth exhibited his surfing skills twice a day in front of the Hotel Redondo.